The real joy of playing a game on PC is that, thanks to mods, your entire experience can be improved by the work of dedicated fans. Because some mods are so extensive, transforming almost everything about the source title, we felt it was only fair to list 12 of the best of them here, since they may as well count as their own new games. Note that due to the nature of these lists we do—highlighting the very best titles on major platforms—we've decided to only include mods that create a significantly new experience, whether that be in the form of a "total conversion", or advances that fundamentally alter (or repair) a game. 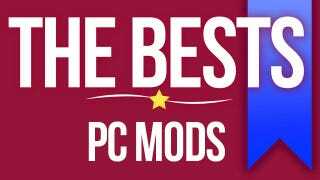 If all a mod is doing is tweaking features or adding items, while that's great for users/fans of that game, it doesn't warrant a shout-out on a standalone list like this. A mod so good that it shouldn't even count. Really, it feels, and plays, like a standalone game, a professional remake that you'd pay $50 for. But hey, it's not, it's a mod, and a free one at that, one which took an insane amount of time to make but which turned out to be worth the wait. A Good Match For: Those who have heard how awesome Half-Life is, but could never get into the original due to its... antiquity. Not For Those Who Want: An all-new experience. It looks new, but it's the same old Half-Life. There's no sticking cover or regenerating health here, kids. Here's how it looks in action. Game Required For Mod: Anything with a Half-Life 2 key. What more needs to be said about DayZ, one of the success stories of 2012 and a rare time a mod doesn't just improve a game, but creates an all-new experience that teaches full games a thing or two about design. It's soon to be released as a standalone game, but for now, the ArmA 2 mod is the only way you can experience the horror of zombie survival. A Good Match For: People who want a true zombie survival experience, not just an action game where zombies are used as a substitute for aliens/monsters. Also, those capable of getting a handle on a first-person game more complicated than your average shooter. Not For Those Who Want: A quick, exciting experience. The game can drag, and being based on a serious combat simulator, isn't exactly "pick up and play", either. The world has been starved of quality official Battlestar Galactica games. Thank the Lords of Kobol, then, for the team behind Diaspora, which takes old space shooter Freespace 2 and turns it into a Viper simulator the equal of any retail space shooter. Few of the usual pitfalls for mods of this kind—poor voice acting, a lack of polish—exist. It's fantastic. A Good Match For: Fans of space shooters and Battlestar fans alike. Not For Those Who Want: A truly cinematic Battlestar experience. The devs have done a fantastic job, but if you're hoping for guest starring roles from the cast of the show, you'll be sorely disappointed. Game Required For Mod: None! While based on Freespace 2, the mod is self-executing, meaning you only need the mod files. Sure, successors and imitators have come thick and fast over the years, but let's not forget that the inspiration behind League of Legends was a mod. A mod for, of all things, Warcraft III. It's a little long in the tooth now, at least visually, but the core experience is as strong as it ever was, and there are still plenty of people hanging around to play against. A Good Match For: History buffs and those who'd like to see where the whole MOBA genre began. Not For Those Who Want: To take this a little more seriously. The attention and crowds have moved on to more modern interpretations like Valve's DOTA 2 and Riot's League of Legends. It was tough choosing between this and Modern Combat, but in the end I had to settle for Eastern Front. The original Company of Heroes shipped with only three real sides: Germans, Americans and, later, the British. No Soviets. Company of Heroes 2 fixes this, but...it's not as good a game as the original, so you should download this mod, which not only adds new units, but goes all out to make it an authentic Soviet experience. A Good Match For: Those a little tired of the existing factions in the game and after a new challenge, a new experience. It's also a totally free way to play as the Soviets in the Company of Heroes games, for cheapskates who don't want to pay for Company of Heroes 2. Not For Those Who Want: All the improvements we're going to see in Company of Heroes 2. While there are dramatic changes here to everything from units to maps, this is still based on the original Company of Heroes, so this won't be a direct substitute for CoH2, especially in terms of things like the new advanced weather systems. This is somehow more than just a mod. It's a video game experiment. You can fit over 1000 people on the same enormous map, resulting in some of the most hilarious and explosive multiplayer this medium has ever seen. One round of this and you'll never think 64 players is "a lot" ever again. A Good Match For: Pranksters, griefers and those who are prepared for the fact that when so many people get together on the one map, crazy and unpredictable things will happen. Not For Those Who Want: A quiet, peaceful time. This mod does not feature quiet, peaceful times. The Nameless Mod is a total conversion of Deus Ex, improving the visuals and building an all-new world, one bursting with thousands of lines of spoken dialogue and five endings. Its a shocking achievement, one that makes this feel like an official spin-off rather than the fan-made project it is. A Good Match For: Those yearning for the days of old, when a Deus Ex game was a little uglier, but also a lot more complex. Not For Those Who Want: Something like the new Deus Ex. Game Required For Mod: Deus Ex. I shudder to think of the amount of work that went into this. Most Elder Scrolls mods, regardless of which game they're for, are about adding things to the world that's already there. Nehrim crafts a whole new "campaign", with new terrain, new buildings, towns, and even a new storyline. It's not even set in the Elder Scrolls universe! A Good Match For: RPG fans who'd like an accessible, enjoyable and gorgeous game that's not set in the Elder Scrolls universe. Not For Those Who Want: An Elder Scrolls game! Because this is an all-new world and story, the only things it has in common with Oblivion are visual assets. Tough, old as boots and utterly uncompromising, NeoTokyo isn't just one of the longest-serving mods on this list, it's also one of the prettiest. A Half-Life 2 mod designed to look like the coolest anime you've ever seen, it's a must-play for anyone who's wanted to shoot their way through a dystopian future Tokyo, but never had the chance. Because, you know, reality. A Good Match For: Fans of games like Counter-Strike, who value fast-twitch response times above all else. It's also worth a look just for the art design. Not For Those Who Want: An easy-going shooter. This thing is hard, particularly so for fresh meat who have never played the game before. Game Required For Mod: Any product with a Half-Life 2 key. The sequel to Knights of the Old Republic was a crushing disappointment. Not because its content was terrible; it was pretty good! It's just, it wasn't all there. Parts of the game were missing, especially near the end, leaving players feel under-done. This project takes an unfinished game and finishes it. It's pushing the limits of my "must be transformative experience" rule for this list, but seeing as what it does salvages and restores a great game I wouldn't otherwise recommend, it makes the cut. Just. A Good Match For: Star Wars fans perhaps looking for a more involving experience than the cold embrace of the Old Republic MMO, who might have been put off by KOTOR 2's lukewarm reception pre-mod. Not For Those Who Want: A modern Star Wars RPG. Going back to these games after, say, Mass Effect shows how far BioWare's systems (even though this particular game was handled by Obsidian) have come. Galactic Warfare transforms Call of Duty 4: Modern Warfare into a Star Wars game. Aside from the weird shuffle of the infantry, the transformation is a complete one, from the levels to the weapons to the sound. Given the lack of new Battlefront games, this is as close as you're going to get to engaging in some contemporary Star Wars multiplayer gaming. A Good Match For: Shooter fans longing for a new Battlefront game, who know deep down they're probably never going to get one. Not For Those Who Want: A direct substitution for Battlefront. This is based on Modern Warfare, after all, so maps are tight and team sizes (relatively) small. Game required for mod: Call of Duty 4: Modern Warfare. I love Total War. My personal favourite mod is Darthmod's overhaul of Empire, for example, but under the rules of this collection, that doesn't count. What does count is the incredible Third Age mod, which strips Medieval: Total War 2 back to its bones and replaces it with an epic strategy game straight out of Peter Jackson's original Lord of the Rings trilogy. The massive army sizes and melee combat of Medieval 2 were born for a mod pitting Rohirrim against Orcs. A Good Match For: Anyone wanting to control the vast armies of Middle Earth, and left frustrated by the more "intimate" nature of EA's official RTS games from a few years back. Not For Those Who Want: That same kind of "simple" experience you got from EA's games. The Total War series is a bit more involved, and requires more of your time (and brain cells).